now, with 10x more wire is a collaboration with my friends Kyle Lapidus and Tali Hinkis from LoVid. We made it as part of the ART@*^<>WORK show that Tali and Elana Langer put together in a midtown Manhattan office space. The show "explores the tension between the art of work and the work of art." For our piece I gathered a bunch of Computer Music Center detritus (wires, motors and fans removed from broken equipment, old office supplies, etc.) and Kyle and Tali brought some of their old video gear. 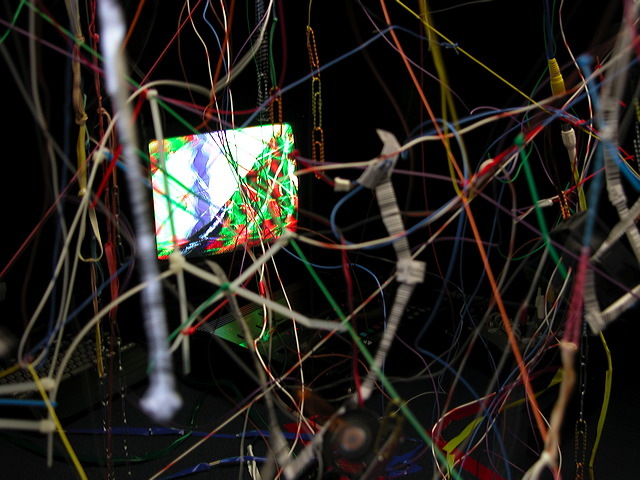 Over a weekend we transformed a generic cubicle into a humming, bobbing mass of colorful wires, twirling motors, and mutant video. The video was captured from a camera suspended above the cubicle and then processed by an old skool video titler and a semi-functional colorizer and then presented on a small monitor under the desk. It took us quite a while to decide what to do for this piece. My office at the Computer Music Center is also my studio, and it's often not clear, even to me, when I'm doing "work" and when I'm doing "art". So when I looked around for materials that remind me of work, they ended up being exactly the same materials I tend to use in making art. Kyle and Tali together have the equivilent of about 17 full time jobs, none of which involves a cubicle, regular hours, or even necessarily a paycheck, but all of which intersect with and blur into their work as artists. So although we never did come up with a clear concept for our piece, what we ended up with nicely reflects the messy, but vibrant relationships between our "art" and our "work".